From April 15 - October 7 at Olympic View! Olympic View Golf Club boasts a variety of golf holes that compliment individual masterpieces. Nestled deep inside a pristine forest, natural beauty is punctuated by two waterfalls, twelve lakes, roaming deer, soaring eagles, and the beautiful snow peaked Olympic Mountains in the horizon. If some of the golf shots on this target venue quicken your pulse, the tranquility of our setting should help to calm and center you. The 17th hole encompasses enough natural beauty for an entire course. From the tee, aim toward a breathtaking 40 foot waterfall that frames the green 455 yards away. This signature hole plays through a steep, narrow valley past a huge rock column and an elegant Japanese garden. It's no wonder Olympic View was the first golf course in British Columbia that Tiger Woods played, as an amateur in 1994 (view video). GBC Golf Academy: full practice facility with driving range, short game area, and practice bunker. Instruction available year round. Environmental Sensitive Area (ESA)- Defined by White stakes with green tops and wooden fences around Oak Trees on #4 #5 #6 #7. Play from these areas are prohibited and must take relief with accordance with "Ground Under Repair". Cellular Phones, Beepers, iPods, or Other Electronic Equipment - Are permitted but shall be used in a form that does not disrupt the enjoyment of other golfers. Drop Area - Has been provided on hole #12. For players' safety and course maintenance, please observe all posted information. Pace of Play - In the interest of all players, please adhere to our 4 hours and 30 minutes pace of play. Golf course representatives reserve the right to direct you to pick up your ball and proceed to the next teeing ground if your group falls behind one complete hole. Dress Code is relaxed. 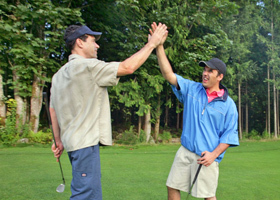 Comfortable golf attire, such as shirt, pants or shorts and suitable footwear is required. Multiple layers are encouraged as weather can change quickly. Steel Spikes not allowed. Washrooms - Located behind the 6th green, above the forward tee on the 5th tee, and behind the 13th green immediately left of the 14th tee.